If you're in the mood for a mental workout then this game is for you. 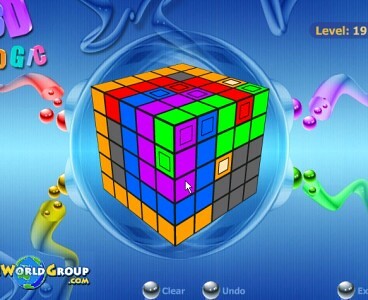 In 3D Logic you need to color squares on the cube to connect between the different color start and end points. 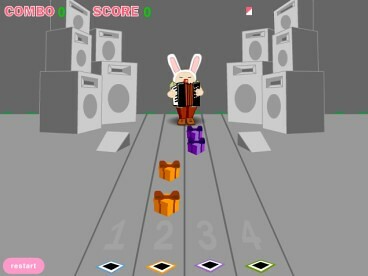 The first levels are pretty easy but around level 19 it starts becoming quite difficult. I made it up to level 21, how 'bout you? If you feel like cheating, here are the solutions to all the levels. In the holiday spirit I bring you this holiday themed online adaptation of the popular Guitar Hero game. I know it sounds cheesy but it's actually fun to play (and you don't even need an accordion). 'Tis the season so 'tis the time for a wintery holiday online game. 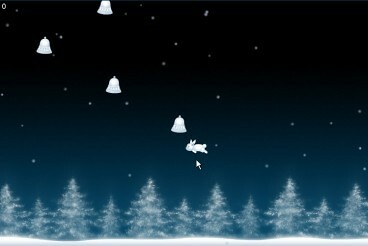 Winterbells is a sleek simple online game where all you need to do is move the bunny to catch bells without falling. Every bell that you hit makes you jump up so that you can catch a bell that's above you. If you jump up and don't manage to hit a bell you fall all the way down and the game is over. A very simple game that's easy to learn and has a nice feel to it. I got 21420 points, how about you?